There are many times when it would be useful to open up streets to people on a part-time, regular or irregular, basis. As a mechanism for trialling pedestrianisation (either part-time or full-time) of streets. These ​all rely on the core condition of opening up a street to people walking and cycling, rather than the current main use of our streets which is the through-traffic of larger and heavier vehicles such as cars, vans, trucks and buses. When they're regular, busy and give key visual cues to indicate that they're predominantly pedestrianised (eg the street is all at the same level), they tend to simply rely on legal signage. By their nature, there isn't much requirement for enforcement. Grafton Street and Henry Street are pedestrianised 11.00-06.00 (ie 19 out of 24 hours) and allow access for commercial deliveries outside of those hours. 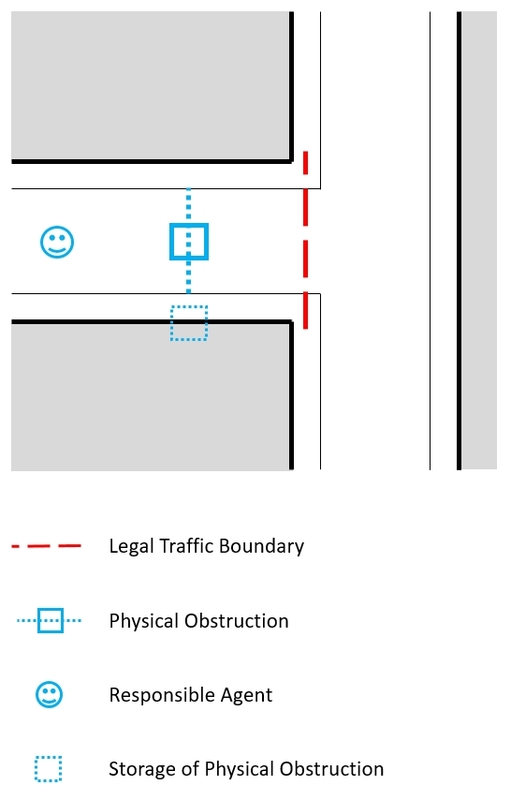 But when they're irregular, quiet streets, or designed to clearly visually and physically separate into lanes (with a step in level between pavements and the carriageway), they tend to also require a physical obstruction to be placed into the roadway in order to both send a clear visual cue to anyone driving or cycling, but also to physically act as the enforcement to prevent anyone from doing so. The pedestrianisation trial on Suffolk Street by the Grafton Street team (only for 6 weeks) used a planter box and flexi wand bollards. It would be useful to find a method that is simple to use, effective, and scalable. More likely, it will be the principle that will be scalable and we'll need a few methods to suit different scenarios. The below plan of a T-junction between two streets shows the principle. The red line is the legal aspect - it is the element that legally closes the street to traffic. Everything in blue is a belt-and-braces addition that then essentially simply becomes objects inside of a pedestrianised space. None...ie mechanical / automated solution. We'd like to discuss what might work best for each of these items A-E. In order to help us to dicuss this topic, we've picked a street on which we hope to trial the above aspects - Essex Street West in Temple Bar. It's already pedestrianised but permits commercial access 06.00-11.00, and so that enables us to take the above red 'item A' off the table, and just focus on the blue aspects B-E.
People walk about 12,000 times through this street each day (11,000 during the week and 13,000 at weekends). About 800 vehicles pass through it on average per day, approximately equal between 4-wheeled vehicles and 2-wheeled vehicles. About 80% of all the vehicles pass through it during the pedestrianised hours. Any trial would be fully reversed back to the current scenario following the trial period. Easy to put in place, easy to remove. But not too easy to remove by the wrong people. Minimal lifting of heavy weights or awkward shapes. Eg not blown over in high winds, not damaged by rain or UV light. This would help mutiple people be keyholders - to increase resilience. An alternative could be that there would be several 'copies' of the object - eg several bollards, or several signs. As its role is to act as physical barrier, there's a possiblity that a person driving (and breaking the law) could hit it. So it probably shouldn't invite much interaction (eg a bench or a basketball hoop are probably not suitable). Won't cause issues for people with disabilities (particularly sight issues). Faciliates a message to be placed onto it. For example, automated bollards might be suitable for streets which are opening up very regularly, or if there is a need for some form of all-day access by vehicles, or for locations with no 'Repsonsible Agent'. They probably do not make much sense on a suburban street that opens the odd time for a Street Feast. Low-tech, easily replaceable, solutions might best suit occasional, or low-traffic, Open Streets. If you can think of suitable objects, please comment below. We'll be initially working with Temple Bar Company for this role. They already carry out a similar role in two other locations in Temple Bar. This may be resolved simply by our selection for item B. We will update this section as we learn more.